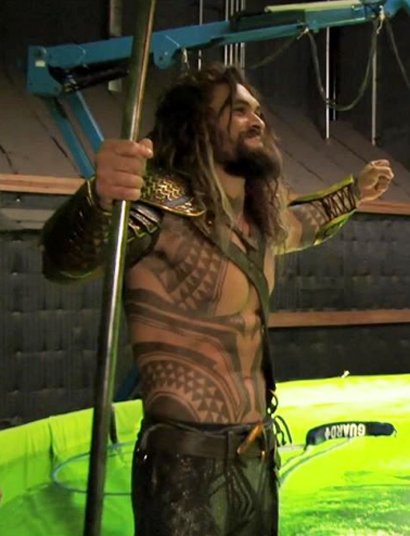 Yesterday we got some brief glimpses of Jason Momoa doing some work as Aquaman for next year's Justice League movie, the first real shots of him in full, real life color! "I am King of the Kiddie Pool! Bring your tribute of water wings and pool noodles!" Actually, this is really cool. Not my favorite look for Aquaman, but it is A look from the comics, and a valid way to go. He looks great. Yes! Aqua-tastic! If I had that physique, I could, dare I say it...rule the seven seas! Sure wish Jim Aparo was alive to draw the film adaptation. These pictures are great! Interesting how a lot of the design elements of this Aquaman's tattoos are based on Momoa's actual tattoo on his left forearm.